Confession #1: I’ve never eaten pie before. 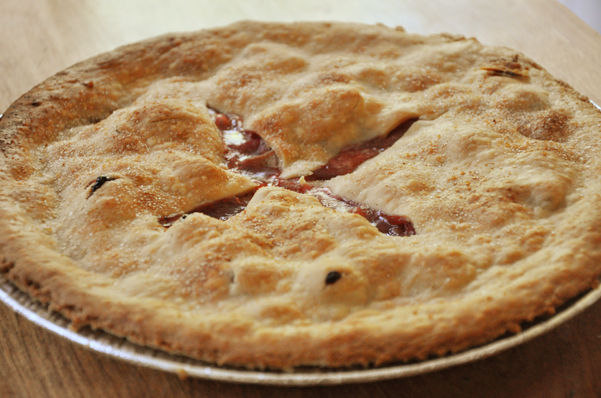 Confession #2: I have now fallen, completely head over heels for pie. Combine the dry ingredients in a large bowl. (reserve about 1-2 tbsp for topping) Slice the rhubarb and strawberries. Once done slicing, combine the fruit with the other ingredients stirring around. Spoon the mixture into a pastry lined pie plate and lay the top layer of pastry on top, sealing the edges. Bake at 425 for 12 minutes, turn down the heat to 300 degrees and bake for 30 minutes. Despite the bought pastry, this pie was perfect, it was enjoyed by many… I stashed away the one remaining piece for dessert… on second thought, I’m going to go and eat it now before anybody else finds it! recipes...Keep the "delish" recipes coming!